Designs for Health is a professional brand, offered exclusively to health care professionals and their patients through referral. By providing comprehensive support through their extensive line of nutritional products, their research and education division, and their practice development services, Designs for Health is able to maximize the potential for successful clinical health outcomes. 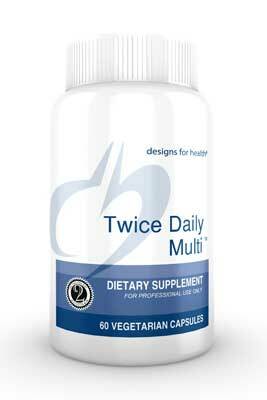 Twice Daily Multi™ contains optimal amounts of many nutrients not easily obtained in most diets. It uses higher quality ingredients than most multivitamins, including vitamin E as high gamma mixed-tocopherols, our proprietary NatureFolate™ blend of active isomer naturally-occurring folates, and TRAACS® true amino acid chelate minerals for optimal tolerance and absorption. These exceptional ingredients are combined in an up-to-date, science-based formulation to create a truly superior multi. Made with non-GMO ingredients. 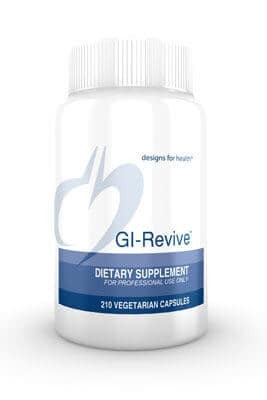 GI Revive™ was reformulated and is now free of shellfish and xylitol. GI Revive™ offers comprehensive support for optimum gastrointestinal health and function. The lining of the gut must have proper permeability and integrity so it can not only absorb nutrients, but also prevent toxins, allergens and microbes from gaining access to the blood stream. Maintaining gut health is the key to maintaining overall wellness. GI Revive™ is available in capsule and powder form. The powder, which is sweetened with organic stevia, can be mixed into any beverage or functional food powder and can be used as part of a health program for achieving optimal GI health and regularity. Made with non-GMO ingredients. 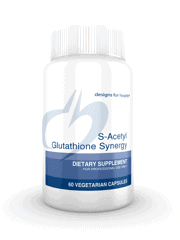 Acetylated form of glutathione for optimum absorption and bioavailability S-Acetyl Glutathione (S-A-GSH) is a unique form of glutathione, one of the most powerful antioxidants naturally produced in the body. It has an acetyl group (COCH3) attached to the sulfur atom of cysteine in the glutathione molecule. S-A-GSH is well-suited for oral ingestion, because this acetyl group protects glutathione from breaking down in the gastrointestinal tract; once absorbed and inside the cells it is removed, thus leaving the glutathione molecule intact. This product also includes N-acetyl-cysteine (NAC) and vitamin B6, both of which are important for the production of glutathione. Made with non-GMO ingredients.